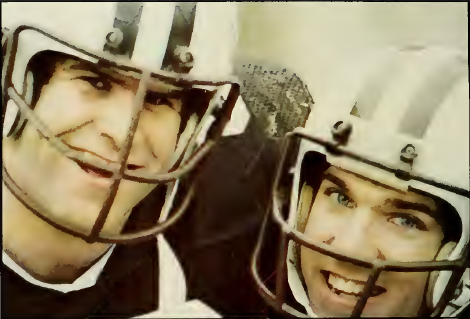 I thought a fun way this season to show off the historic nature of Lehigh and Lafayette’s football Rivalry might be to do a jump through the decades. 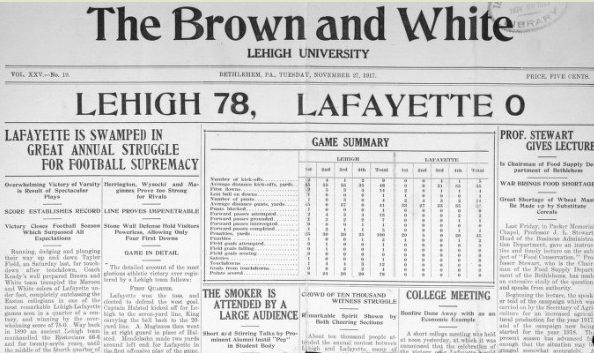 Lehigh and Lafayette’s Rivalry in football started in 1884, when Lafayette student manager (and founder of the football team) Theodore Welles approached the founder and student manager of Lehigh football, J.S. 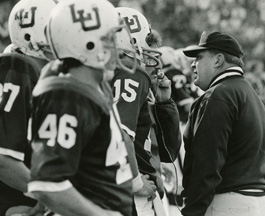 Robeson, and challenged them to a game of “foot-ball”, a ground-based game that resembled more of a cross between rugby and soccer than the modern game of today. 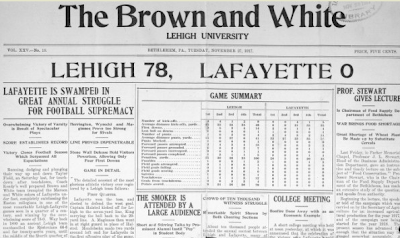 Let’s turn back the clock 130 years, and proceed decade by decade, and you’ll see how many times Lehigh and Lafayette have played over the years, and hopefully get an appreciation on how the game changed and evolved over time.